Plot A centenarian, who wants to set the world record for being the oldest man alive, wants to send off his septuagenarian son to an old-age home, hoping the latter’s brooding demeanor might not rub off on him. In a bid to do so, he ends up showing his son the bright side of life. Umesh Shukla is best remembered for his Paresh Rawal-Akshay Kumar-starrer ‘OMG Oh My God!’ which was based on a Gujarati play. The film worked wonders at the box office and he returned with ‘All Is Well’, featuring Abhishek Bachchan and Rishi Kapoor in the lead. This one, however, sank without a trace. 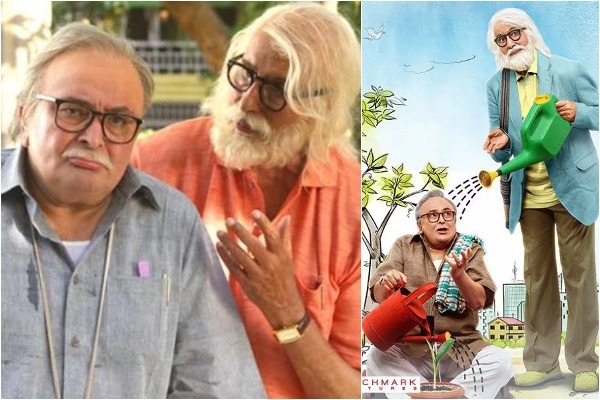 Back with another slice-of-life film, based on a Gujarati play of the same name, Shukla brings us ‘102 Not Out’, which boasts of legends like Amitabh Bachchan and Rishi Kapoor. Keeping it short at exactly 102 minutes, Shukla gives us a breezy entertainer that somehow seems to lose steam in bits and parts. Dattatraya Vakharia (Amitabh Bachchan) is a grand, old man, aged 102. He is full of life and bustling with vigor with each passing day. “I’m strictly opposed to dying,” the old man keeps saying every now and then and he wishes to break the world record for being the oldest man alive. But there is a hitch. His only son Babulal Vakharia (Rishi Kapoor) aka Babu, is a 75-year-old glum guy, who also has a terribly bad temper. Mostly grumpy, Babu is a former mathematics professor, who sees the glass half empty at all times. Quite contrary to his ageing father, Babu has given up on the bright things in life and has decided to lead his life the way it comes. Dattatraya wants Babu to spend the rest of his days in a retirement home with nobody to disturb him and let him be the way he wants to – all alone and unperturbed. But Babu doesn’t want to budge. Datta knows that if his son will give off negative vibes, he won’t be able to make it to “sixteen more years” for the record. He then takes it upon himself to set things straight before it is too late. Umesh Shukla’s ‘102 Not Out’, superbly written by Saumya Joshi, gives out a positive outlook on life and is a thoroughly enjoyable ride albeit in bits and parts. A little hatke from the regular fare, the film is about an unusual love-hate relationship between a super old father and his cranky old son. It makes you laugh your guts out and also tugs at your heartstrings at the same time. Amitabh Bachchan is ageless and matchless and the fact goes without mentioning! He plays a spirited and lively centenarian very effortlessly and gets his Gujarati accent spot on too. He slips into his role like he has been doing over all these years and despite playing such an older character, he still gives the younger generation a run for their money! His make-up and a few prosthetics, however, could have been a bit more refined to give him an authentic centenarian look. Also, he sometimes goes a little overboard in his lively old avatar, which does not seem to match a character of a 102-year-old in reality. Rishi Kapoor plays the temperamental 75-year-old to a T and leaves a lasting impression. Watch him when his father sings to him and he scorns whether he will also sing the female part of the song! He impresses and carries an eternally-gloomy expression that makes you pity him even more. Bachchan and Kapoor return after a gap of twenty-seven years and make for an amazing pair. They light up the screen with their cheerful banter and jovial taunts. Jimki Trivedi, who plays the Man Friday, is the only other man in both the men’s lives and the actor makes sure he stands his ground while sharing the frame with two stalwarts. Although there are certain loopholes in the story, which tend to stretch the film, they can be overlooked easily. At 102 minutes, the film might sound like it is short and sweet, but with a few long-drawn-out scenes, where the senior lectures the junior about the plusses in life; it tends to tire you out. Despite the few lows that mar the screenplay in some odd places, Saumya Joshi’s life-like film, which Umesh Shukla brings to life on the big screen, is full of life and thoroughly pleasant. All in all, ‘102 Not Out’, with some superlative performances and dialogues, is a one-time watch.